“The hidden risks of suicide and depression for seniors living in long-term care.” PBS Newshour. April 9, 2019. “How the way we talk about suicide can prevent it from happening again.” (video 9 min, and transcript) PBS Newshour. March 26, 2019. “A Unique Suicide Risk Assessment Tool.” Columbia Lighthouse Project. The Columbia Protocol, also known as the Columbia-Suicide Severity Rating Scale (C-SSRS), supports suicide risk assessment through a series of simple, plain-language questions that anyone can ask. “Bill Boggs interviews Judy Collins in herNew York apartment.” (video, 34 min) An in-depth interview with legendary folk singer Judy Collins. She talks about the loss of her son to suicide at 22:42 of the video. January 4, 2018. “Suicide Can’t Be Predicted by Asking About Suicidal Thoughts.” NeuroscienceNews.com. February 2, 2019. Gives those who have lost someone to suicide the opportunity to talk with our experienced volunteers. These AFSP volunteers, who are themselves survivors of suicide loss, offer understanding and guidance. Available in person, on the phone, or by video chat. Online Webinar: Suicide Loss Support Series: Because Love Never Dies, with David Kessler, author and leader on healing and loss. His books include On Grief and Grieving with Elisabeth Kübler-Ross. Resilience: Powerful Practices for Bouncing Back from Disappointment, Difficulty, and Even Disaster By Linda Graham MFT. View video conversations with experts on recovering resilience. Listen to audio recordings of resilience exercises. “Solomon Thomas: My sister ‘was the light of my life’.” ESPN. September 19, 2018. “Football Star Solomon Thomas Lost His Sister to Suicide, and Now He’s Speaking Out.” (video, 7 min) ESPN. “Footprints in the Snow Lead to an Emotional Rescue.” by Ty Gagne. New Hampshire Union Leader. January 5, 2019. “Nearly 1 in 5 teens seriously considers suicide. Can schools offer relief?” (video, 8 min) PBS Newshour. November 13, 2018. “Children, Teens and Suicide Loss.” PDF Booklet. American Foundation for Suicide Prevention (AFSP). “Mental Health: The Power of Community to Heal Our Minds.” Yes! Magazine. 2018. 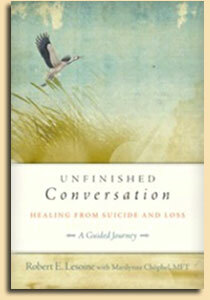 “What Remains: The Aftermath of Patient Suicide.” Psychotherapy.net. Article by Margaret Clausen, PsyD. “Finding Hope” (video, 48min) A CNN Special Report town hall hosted by Anderson Cooper, with guests who have lost a loved one to suicide, and those who have struggled. June 24, 2018. “At the Edge: Separation, Suicide and the Soul.” (audio, 24 min) Mosaic’s Living Myth Project with Michael Meade. June 2018. “In final episode of “Parts Unknown,” Anthony Bourdain discusses death and Buddhism in Bhutan.” (video, 44min) Lion’s Roar. June 26, 2018. “I’ve Lost Someone.” American Foundation for Suicide Prevention (AFSP.) After a Suicide resources. “Returning to School After a Suicide Loss: For Teens.” Dr. Pamela Gabbay, AFSP. “Returning to School After a Suicide Loss: For Younger Children.” Dr. Pamela Gabbay, AFSP. “The truth about my father’s death.” A tribute by David Axelrod, political consultant. Chicago Tribune. June 16, 2006. “10 Things I Wish People Understood About Suicide.” By Jennifer Michael Hecht, author of Stay: A History of Suicide and the Arguments Against It. Vox. Jan 23, 2015. “My son was a Columbine shooter. This is my story.” A TED Talk by Sue Klebold reflecting on her son’s murder-suicide. February 27, 2017. Note: In this difficult and articulate talk, Klebold explores the intersection between mental health and violence, advocating for parents and professionals to continue to examine the link between suicidal and homicidal thinking. “Finding Purpose in Light of This Week’s News.” – following the suicide deaths of Kate Spade, designer, and Anthony Bourdain, celebrated chef and author. Letter from Robert Gebbia, CEO of American Foundation for Suicide Prevention (AFSP.) June 8, 2018. “Suicide rising across the US.” Centers for Disease Control and Prevention. June 2018. “Suicide rates rise sharply across the United States, new report shows.” The Washington Post. June 7, 2018. “Not Alone.” Not Alone Website. A beautifully produced film about teen suicide, written for and by teens. Rent or stream the film, and available for schools. “Suicide: The Ripple Effect” is a feature length documentary film that highlights the journey of Kevin Hines, who at age 19, attempted to take his life by jumping from the Golden Gate Bridge. The film chronicles Kevin Hines’ personal journey and the ripple effect it has on those who have been impacted by his suicide attempt and his life’s work since. In addition, the film highlights the stories of individuals and families who are utilizing their personal tragedy to bring hope and healing to others. “The only thing you need to say to someone who is hurting.” Thrive Global. August 16, 2017. “Statement by the American Foundation for Suicide Prevention on Chester Bennington.” American Foundation for Suicide Prevention. July 20, 2017. “Musician Chester Bennington Dies at 41. Singer’s Death Highlights Higher Suicide Risk for Suicide Loss Survivors.” Statement by the American Association for Suicidology. July 20, 2017. “The Cosmonaut.” (audio, 2 min) NPR KQED Perspectives. May 18, 2017. “A Teachable Moment Using “13 Reasons Why” to Initiate a Helpful Conversation About Suicide Prevention and Mental Health.” (audio webinar, 1hr. 10min) AFSP website. Hosted by AFSP, ASCA, and NASP. May 2, 2017. “’13 Reasons Why’ is provocative and devastating. Is it also dangerous?” (video, 12 min) PBS Newshour. May 2, 2017. “Suicide is Not a Bad Word.” NPR KQED Perspectives, March 8, 2017. Related Resource: SafePlace (Boston area) is an open group of caring people who have experienced the loss of a loved one to suicide. “Coping with Suicide Loss: 9 Lessons for Hope and Healing.” Blog post by Marshall Dunn, author of Letters to Mitch – The Healing Power of Grief, Love & Truth about the loss of his brother to suicide. “Loss Survivors and the Aftermath of Suicide.” By Sheila Hamilton, author of All the Things We Never Knew about mental illness and the loss of her husband to suicide. HuffPost. March 22, 2017. “Helping Children and Teens After a Suicide.” Resource guide. Survivors of Suicide Loss Support Group, Madison NJ. “Information and Support After a Suicide Attempt: A Department of Veterans Affairs Resource Guide for Family Members of Veterans Who are Coping with Suicidality.” PDF Brochure. Office of Mental Health Services, US Department of Veterans Affairs. July 2014. “Suicide in veterinary medicine: Let’s talk about it.” PubMed Central (PMC), U.S. National Institutes of Health’s National Library of Medicine, National Institutes of Health. January 2015. “In Unit Stalked by Suicide, Veterans Try to Save One Another.” New York Times. September 19, 2015. “The Terrorist Inside My Husband’s Brain.” By Susan Schneider Williams (wife of Robyn Williams.) Neurology, September 27, 2016. “Can technology help predict who will attempt suicide?” PBS Newshour. September 18, 2016. “What’s the Mission Behind the 22 Pushup Challenge?” NBC Nightly News. September 3, 2016. “When Jail Becomes a Death Sentence: spike of inmate suicides.” KQED California Report. August 22, 2016. “VA Releases Report on Nation’s Largest Analysis of Veteran Suicide.” Department of Veterans Affairs, August 3, 2016. “Mama Dragons Try To Prevent Suicides Among Mormon-LGBT Children.” NPR Morning Edition, July 7, 2016. “557: Birds & Bees..” – Act 3: Talking with your children about death and suicide. NPR This American Life, May 15, 2015, replayed June 18, 2016. “Judy Collins Reflects On Addiction, Mental Health And Music.” – and her son’s suicide. NPR Here and Now, June 9, 2016. “When a Loved One Commits Suicide.” (audio, 52 min) NPR Forum, May 17, 2016. “I have to learn to care for my suicidal teen with limits but without fear.” Washington Post, February 10, 2016. “Meet the Researchers: An Introduction to the Latest in Suicide Research.” American Foundation for Suicide Prevention, 2016. 12 short, informative videos. Note: Videos posted as they become available. “Suicide rate in U.S. on the rise, with spike for girls age 10-14.” PBS Newshour, April 22, 2016. “Suicide Rates Have Soared in the U.S.” NBC News, April 22, 2016. “U.S. suicide rates up, especially among women, but down for black males.” CNN, April 22, 2016. “Robin Williams Tunnel.” (audio, 2 min) KQED Perspectives, April 8, 2016. “Requiem For A Teen: ‘Tyler’s Suite’ Honors A Life Cut Short.” (audio, 6 min) NPR Weekend Edition, April 2, 2016. Listen to Tyler’s Suite: hear a portion of each movement here on YouTube. “Project 22.” (Documentary about the suicide epidemic amongst veterans – 22 each day. 1 hr. 41 min) PBS. “Local Focus: Project 22.” (Interview with the film makers. 58 min) PBS. “My Perfect Country: Michigan, USA – suicide rate had dropped.” (audio download, 27 min) BBC My Perfect Country, February 28, 2016. “CDC Continues Study of Palo Alto Teen Suicides.” (audio, 1.5 min) NPR California Report, February 22, 2016. “After Rash of Teen Suicides in Palo Alto, the CDC Sends Team to Investigate.” Newsweek, February 16, 2016. “Columbine Shooter’s Mother: I Carry Him ‘Everywhere I Go, Always’.” (audio, 43 min) NPR Fresh Air, February 16, 2016. “Study of female veterans suicide would be required, under new legislation.” Military Times, February 10, 2016. “Perspective: Suicide by Gun.” NPR KQED Perspectives, December 15, 2015. “In Unit Stalked by Suicide, Veterans Try to Save One Another.” New York Times, September 19, 2015. “Unraveling a String of Veteran Marine Suicides, One by One.” New York Times, September 19, 2015. “The Warfighter Perspective: Big Dogs to the Front.” (video, 21 min) with Boon Cutler, Warfighters Rights Leader and combat veteran. “Response to the Spartan Pledge.” (video, 3 min) with combat veterans. “When Deciding To Live Means Avoiding Guns.” (audio, 4 min) National Public Radio, September 24, 2015. “Suicide Rate Nearly Doubles for Black Youth.” National Public Radio, KQED Forum, May 22, 2015. “Obama Signs Suicide Prevention for Veterans Act Into Law.” The New York Times. February 12, 2015. “Obama Signs Act Designed To Prevent Suicide Among Veterans.” National Public Radio. February 12, 2015. “In Preventing Trans Suicides, ‘We Have Such A Long Way To Go. '” National Public Radio, January 5, 2015. “Why Are the U.S. Soldiers Killing Themselves in Battle? Banksy Art Asks.” Vision, October 24, 2014. “In ‘Invisible Front,’ military family’s losses propel battle against mental health stigma.” (Video and transcript.) PBS Newshour. October 16, 2014. “Should terminally ill patients be able to choose when they die?” (Video and transcript.) PBS Newshour. October 14, 2014. “Active Minds Fights Stigma of Mental Illness on College Campuses.” (Video, 2 minutes.) Active Minds was started at the University of Pennsylvania by Alison Malmon, whose brother committed suicide during his senior year in college. NBC News. October 8, 2014. “After the Battlefield, a Veteran Finds Hope on the Football Field.” (Audio, 8 minutes.) I could either take my own life, or I could live my life in a way that honors them that gave their life. NPR, The Takeaway. October 7, 2014. Oregon’s Death with Dignity Act: “Why This 29-Year-Old Is Ending Her Own Life.” (Video, 6.5 minutes.) Refinery 29. October 6, 2014. “One Military Family, Two Lost Sons: One To Combat, One To Suicide.” National Public Radio, All Things Considered. October 4, 2014. “Hero pilot Sully shares family suicide story in wake of Robin Williams’ death.” AZCentral, August 15, 2014. Anne Lamott post on Robin Williams suicide. Facebook. August 12, 2014. “Robin Williams Didn’t Die from a Disease, He Died from his Choice.” The Matt Walsh Blog. August 12, 2014. “U OK? Friends Ask.” American Association of Suicidology Response to the Death of Robin Williams, Michelle Cornette, AAS Executive Director. “U.S. military suicides exceed combat deaths.” (article and videos) CBS News, January 14, 2013. “Imagining Suicide.” Laura K. Kerr Ph.D. Trauma’s Labyrinth: Finding Ways Out of Trauma. 2013.